In our Mobile app development industry, if there is anything that grows at par with the continuous app entries in the stores and the frequent updates, it is the increasing number of programming languages to support the mushrooming. Based on the usability and ranking factors, I have listed down 10 Programming Languages that will define the next year. Here is the list of Top 10 Programming Languages that will dominate the mobile app development market in the year 2018. Swift 4 is based on the strong points of Swift 3, providing better stability and robustness, offering source code compatibility with the Swift 3 language. It has brought in enhancements to the library, and have additional features like serialization and archival. Taking iPhone app development companies to the next level. It is now possible to develop a number of packages before you tag your official release. Also, it easier now to work on branch of packages at the same time. The package products are now formalized, which makes it possible to have a closer look at what the libraries that are published to the clients by the package. To negate the effect of hostile manifests, Swift package now appears in sandbox that prevent file system modification and network access, making mobile apps more secure. Swift, in comparison to Objective-C is gaining popularity with each passing day (as you can see in the image below), and is expected to completely surpass Objective-C iOS app development programming language soon. Java 8 is an upgrade to Java’s programming model and is a coordinated advancement of the Java language, JVM, and libraries. The programming language, which is used for Android app development includes features promoting ease of use, productivity, security, improved performance, and improved polyglot programming. Virtual Extension Methods and Lambda ExpressionOne of the most noteworthy features of the Java SE 8 language is its implementation of the Lambda expressions and the various related supporting features for both the platform and Java programming language. Time and Date APIThe new API allows developers to manage time and date in a much cleaner, easier to understand, and natural way. Improved SecurityThis has replaced the present hand-maintained document of the caller sensitive methods with the mechanism, which accurately identifies the methods and allow the callers to be discoverable reliably. Now the official Google programming language, Kotlin is used for multi-platform app development. 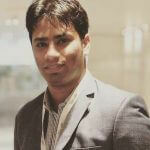 With the help of the language, one can create apps for JVM, Android, Native, and Browser. Since the announcement of it becoming the official programming language, Kotlin has been adopted by a number of companies for their mobile app developemt. Since it’s very new in the industry, we recently wrote an article to help make it easy for the developers to make the switch from Java to Kotlin. Java InteroperabilityKotlin is 100% interoperable with Java, making it easy for the Java developers to learn the language. The platform gives the developers an option to paste their code and it converts the Java code into Kotlin’s. Zero Runtime OverheadThe language has concentrated extensions to the Java library. Most of its functions are in-line which simply become inline code. Null SafetyKotlin eliminates the side-effects of code’s null reference. The language does not compile the codes that returns or assigns a null. Extension FunctionsMobile App Developers can add methods in classes without bringing any changes to their source code. One can add the methods on the per user basis in the classes. React Native is the framework, which uses React to define the user interface for the native devices. Companies invest in React Native Application Development to build mobile apps, which runs on both iOS and Android devices, thus expanding their user base by manifold. Code ReuseThe programming language gives you the freedom to use the same code for both iOS and Android. Live ReloadIt allows you to see the most recent change that you have made to the code, immediately. Strong PerformanceThe programming language makes use of the Graphics Processing Unit, which makes it well tuned for mobile apps in terms of the speed advantage it offers. Modular ArchitectureIts interface helps mobile app developers in looking into someone else’s project and building upon it. It gives the benefit of flexibility as it takes less time for the developers to understand the programming logic and edit it. It is a general purpose language that has a variety of uses ranging from mathematical computing, such as – NumPy, SymPy, and Orange; Desktop Graphical UI – Panda3D, Pygame and in Web Development – Bottle and Django. 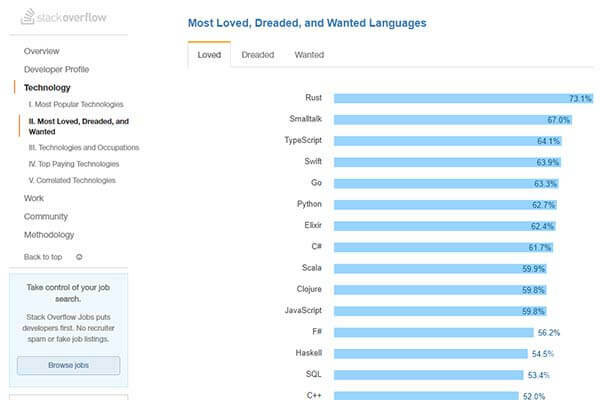 Python is known for its clean syntax and short length of code, and is the the most wanted programming language. The language has a simple and elegant syntax which is much easier to write and read as compared to the other programming languages like C#, Java, and C++. For a newbie it is every easy to start app development with Python solely because of its easy syntax. The mobile app developers can freely use the language, even for their commercial uses. Other than using and distributing the software that are written in it, you can also make changes in the source code. Python can be moved from one platform to another and run in them without any changes. The programming language can run seamlessly on platforms including Mac OS X, Windows, and Linux. Python has standard libraries which save developers’ time in writing all the code themselves. Suppose you want to connect MySQL database on the web server, now instead of writing the whole code by yourself, you can make use of the MySQLdb library. It is an open source program which is used to perform statistical operations. R is a command line driven program, meaning that mobile app developers enter command at the prompt and every command is implemented one at a time. R supports object oriented programming with the generic functions and procedural programming with functions. It can print the analysis reports in form of graph in both hardcopy and on-screen. Its programming features consist of exporting data, database input, viewing data, missing data, variable labels, etc. Packages form an element of R programming language. Thus, they are helpful in collecting the sets of R functions in a particular unit. It makes use of an event-focused, non-blocking I/O model, which makes it efficient and lightweight, ideal for data-concentrated real-time mobile apps that can run across series of distributed devices. Event DrivenAll APIs in the Node.js library are event driven, meaning the Node.js server doesn’t have to wait for the API to return data. Server moves to next API after calling it and the notification mechanism of the Node.js events help servers in getting a response from the last API call. ScalableNode.js make use of one thread program, which can offer service to a large number of requests than its traditional servers such as Apache HTTP Server. Zero BufferingThe Node.js based mobile apps don’t buffer any data. They output all the data in portions. Haskell is a functional programming language. It is a first commercial language to enter the functional programming domain. It is a mix of a number of generalizable functions which define what a program is supposed to do., allowing the lower layers handle the mundane details such as iteration. 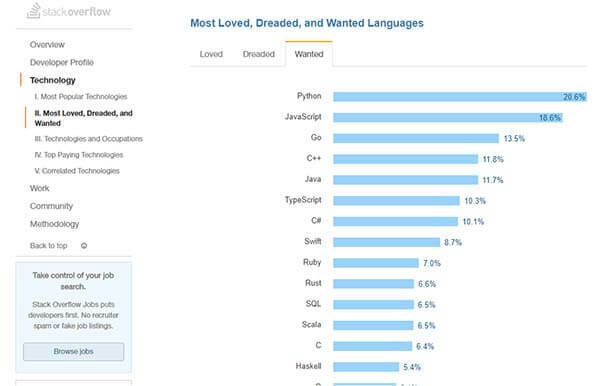 On the top of it, Haskell is one of the top 15 loved programming languages according to Stack Overflow Developer Survey. 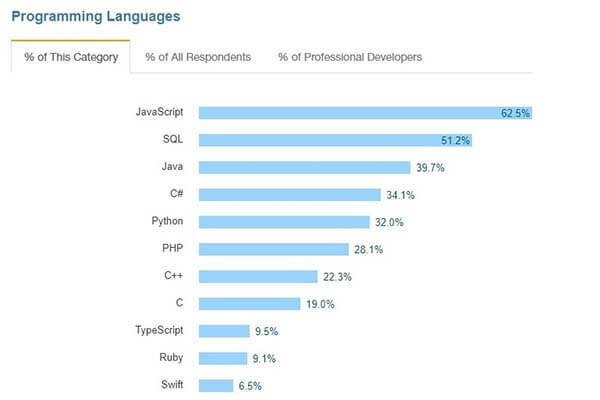 The proprietary programming language used for mobile app development allows plotting of data and functions, matrix manipulations, development of user interfaces, implementation of algorithms, and interfacing with the programs written in the other languages that includes C++, C, C#, Fortran, Java, and Python. It is one of the most superior language in the programs used for scientific and mathematical purposes. According to statistics Google Trends, this programming language will continue to remain in the market. Offers interactive environment for design, iterative exploration, and problem solving in mobile apps. Provide library of functions for fourier analysis, optimization, numerical integration, and Linear algebra among others. Give development tool for bettering the code quality, maintainability, and maximizing their performances. Provide function for integration of MATLAB algorithms with the external languages and applications like Java, C, .NET, and Microsoft Excel. Imperative and StructuredThis programming language supports almost all the structured programming syntax from C, except scoping (right now, it had only function scoping with var). From ease of development to the richness of the end application, there are a number of reasons why the world continues to see advancements programming languages – making them newer and better. Learning and using the ones mentioned in the article will definitely help you win the rat race to delivering top ranking mobile apps.